Showing results for tags 'delight'. I just tried Kay's Naturals Gluten-free Almond Delight Protein Puffs and I have to say that they were not a disappointment. With only 115 calories, 12 grams of protein and 2.5 grams of fat (no trans fats) per serving, I was a bit skeptical, but this crunchy snack kept me satisfied between meals--guilt free! I love that it is made with real almond meal and almond butter because I just despise any artificial flavorings. 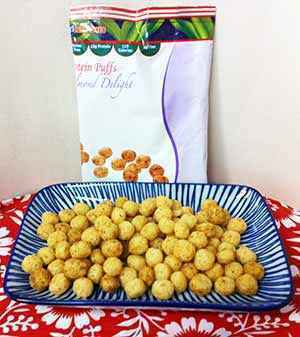 These little puffs are packaged in individual serving sized bags, which are not only convenient but they help keep the flavors and textures fresh. To find out more visit shop.kaysnaturals.com. Note: Articles that appear in the "Gluten-Free Food Reviews" section of this site are paid advertisements. For more information about this see our Advertising Page.